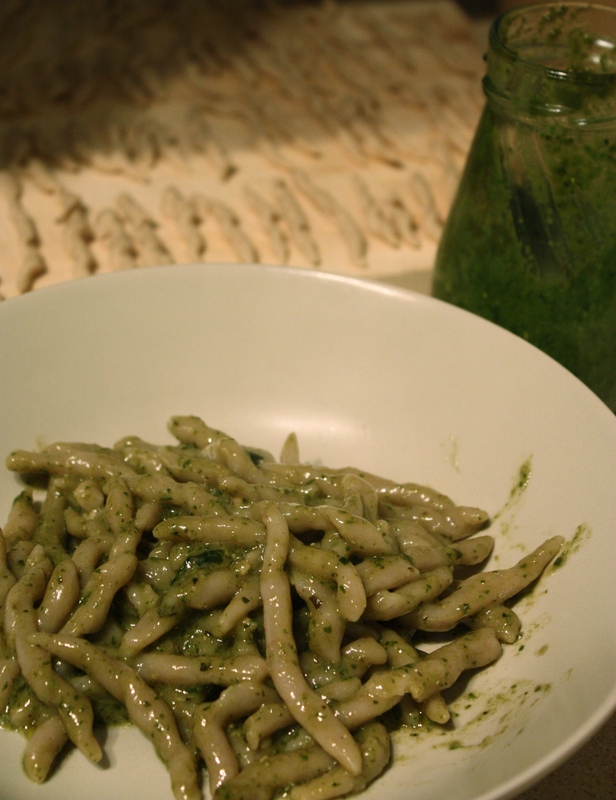 After the pesto recipe it was obvious to post a pasta recipe perfect to use with pesto. This is THE pasta for pesto, it is called trofie, and it comes from Liguria, the same region of the gorgeous green sauce. Trofie are usually made with a part of whole wheat flour, but, as in this case, they can be made using some chestnut flour. We bought the chestnut flour from Shipton Mill, they have an online shop with an incredible range of specialty high-quality flours, definitely worth a visit. Trofie have a typical curled shape which can be done by hand, it is not difficult, but, as everything, you need to try a couple of time. 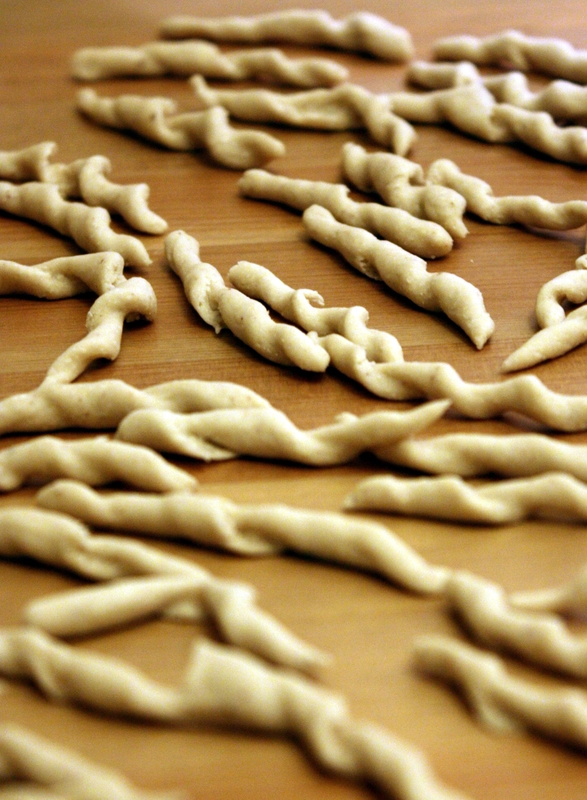 We never did trofie before, so, probably, they do not have a perfect shape, but we can swear, they were delicious. Put the flour and the salt into a bowl and add the water. Knead the dough for about 10 minutes on a wooden board. Then wrap the dough in a plastic bag to rest for half an hour. Took a piece of dough and roll it into a “worm” shape of about 0.5 cm of diameter. Cut this long worm into smaller pieces about 2-3 cm long and roll them on a work surface. The movement to curl trofie is easier to do than to say, you can find a short video here. Do not get depressed if the first trofie do not look perfect! Take your time, and try again, after 30 or 40 trofie you will get used to it! Patience will be rewarded! When the trofie are ready you can cook them immediately or after some hours, or you can freeze them. For the cooking, bring to boil some salted water and then add the pasta and cook for about 10 minutes. Needless to say, season with pesto alla genovese. This entry was posted in Pasta, Primi, Vegan, Vegetarian and tagged chestnuts flour, pasta, pesto, trofie. Bookmark the permalink.